Casey, who is almost four years old, soothes red-faced wailing children. She gives harried businesspeople a moment of calm as they scramble to catch connecting flights. She shimmies and wriggles on the floor, delighting most within her line of sight. 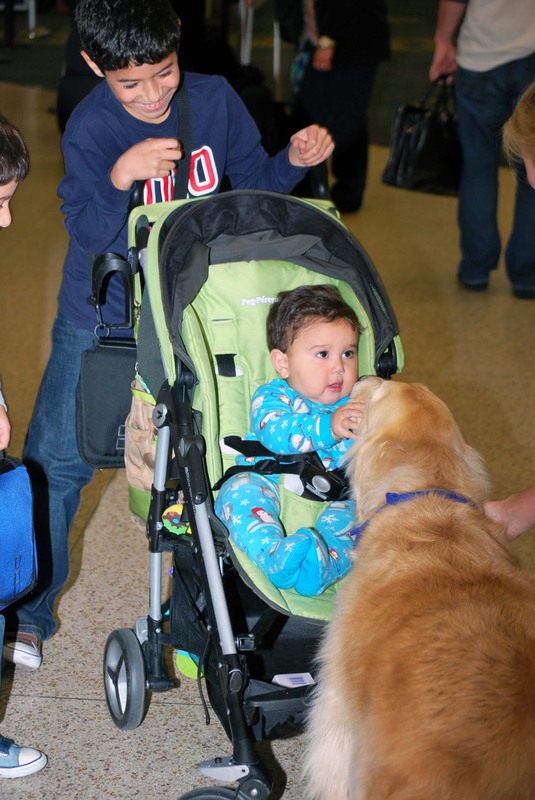 Casey is the 69-pound golden retriever-in-residence at Miami International Airport. 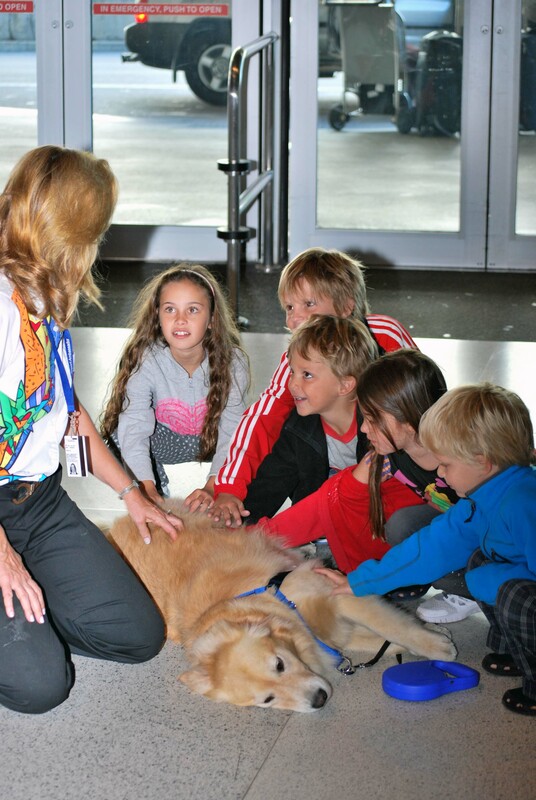 As the airport’s official “K-9 ambassador,” she and her owner, Liz Miller, volunteer for two hours on Mondays and Thursdays, helping passengers feel at ease and spreading goodwill on the concourse. It’s one of the airport’s unique ways of providing a rich customer service experience. But Casey isn’t the only one working her magic. Miller, a former consultant and human resources director, is Casey’s human sidekick at Miami International (MIA), which spans 7 million square feet and services the most international flights in the United States. How did your skill set – HR and consulting – segue into volunteering with a golden retriever? Two years ago, I left my position as director of human resources and opened a specialty dessert sauces company, which had been my dream for quite a while. That left more time to focus on volunteer work, and volunteering at the airport was one of my first choices. What inspired you to bring Casey into that equation? Casey is our family dog, our fifth golden retriever. She went through obedience training and is a certified therapy dog. I took her to do therapy dog work at a local children’s hospital, where I saw her love of humans and how much she delighted kids. I thought that she’d be a natural doing the same kind of work with passengers at MIA. With about 105,000 passengers coming through the concourses daily – and lots of stressed travelers – the opportunity to make a positive impact there was huge. I thought Casey could do it. Do you typically approach passengers, or let them come to you? Both. People approach Casey and pet her, and sometimes end up on the floor with her in a lovefest. Other times, I watch people’s body language – they might brighten up when they see Casey, but don’t come over. So I’ll walk over and ask if they want to meet her. Usually, a child’s screaming and crying will stop when we approach. Does Casey wear a uniform on the job? Yes: a cobalt blue vest with the words “pet me” on the back, and an official MIA security badge, just like mine. Casey even has her own business cards; a paid MIA employee responds to everyone who writes in. They sign off with Casey’s paw print. You volunteer with Casey twice a week, but mentioned that you’re “open to special requests.” Like what? Sometimes, airlines ask us to see off a large group passengers at a certain gate. Other times, Casey will get an email from a family, asking if she can come in and greet them as they arrive, or before they depart. In February, we got to the airport at 8 a.m. to see off a family with five kids going on a ski trip. Casey started wriggling on her back, and all the kids got on the ground and mimicked her. We still get messages from that family. One occasion you truly made a difference: I heard screaming at the international arrival gate. The source was a 2-year-old girl standing on her seat, kicking at her mother, who was trying to placate her. I knelt down next to her with Casey, and she immediately stopped. It was like manna from heaven. I quickly realized the little girl and her mother spoke Creole, not English, but the universal message of touch and calm and safety came across. When we got up to leave, I could see the other passengers saying thank you, thank you, thank you with their eyes. Another time, Casey pulled me toward a young boy who was traveling with his parents. She pressed her head against him, and he bent down to kiss her head. It was beautiful. But not every traveler loves dogs. I’m really sensitive to that. I don’t approach little children unless their parents have given me eye contact, so I know the parent is receptive. I would never approach it if the parent was reticent. Has Casey ever bitten a passenger? You think I would tell you if she did? (Laughs.) But no, thank God. Once, I misunderstood someone’s look, and went over to introduce Casey, but he put his paper up. I got his drift. Do you work overtime during the summertime and holidays, when travel stress is at all-time highs? If we work more than two hours at a time, Casey will push against my knee. If I resist, she’ll pull on the leash and get angry with me – she needs a break. After those two hours, she falls right asleep. Best part of your job: The visual thank-yous – like huge smiles from passengers – and the verbal ones. And the awe, the surprise, from passengers. Casey’s presence has a ripple effect: when I look up, I’ll see people standing and watching us 10 yards away, smiling and talking to each other. Most challenging part of your job: For every two hours spent in the airport, I spend about five to six hours preparing or coming down from it. It’s a lot of energy being constantly “on”; it’s like a full day’s work. What kind of preparation? Keeping Casey’s coat clean and groomed. It’s absolutely beautiful, and the softest thing ever. Then there’s getting myself prepped, and getting to the airport takes about 45 minutes. But it’s worth it. What would people be surprised to learn about your job? A therapy dog’s tolerance level is about one and a half hours. Casey’s is two hours, but she’s doing a lot of walking and getting touched a million times – and doesn’t necessarily know where the hands are coming from. Part of my job is making sure she’s safe. Any other pets at home? My sons. (Laughs.) No, not right now. Where does Casey spend her off days? At Totally Dog Day Camp, a five-acre rural area a little south of [Miami]. Twice a week, a small school bus picks her up at 7:30 a.m., and she has her own seat – all the dogs do. The windows stay half-open so the dogs can hang out and bark and love life all the way to the camp. They’re let loose to run, play, and go on hikes around the property, which has a huge bone-shaped swimming pool. I pick her up from the bus around 5:30 p.m.
1. Be very comfortable working and engaging with a dog for a number of hours per day. Build a loving rapport through obedience training. 2. Put yourself out there and initiate contact with strangers. You need an ease with the public. This is a vulnerable position, and you must be able to read people’s body language to see whether they will be receptive to your approach. 3. Enjoy finding out about other people, and be a good listener. The dog breaks the ice, but the handler is the one who must engage in conversation and coax people out of their shells. It’s teamwork. If at any time I see a passenger looking really distressed or confused, I deal with that immediately and help solve his or her problem. Casey’s business cards: no bones about it. 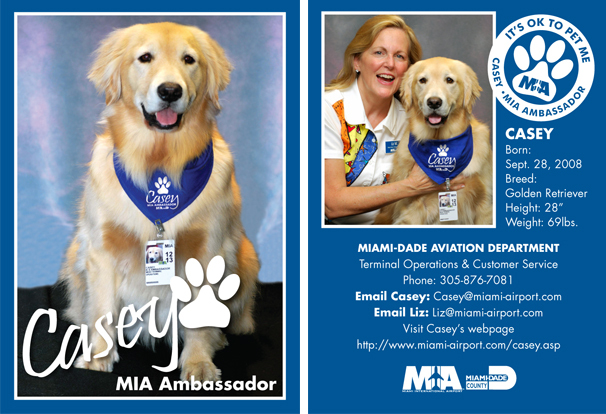 Check out Casey’s personal site, or email her at casey@miami-airport.com. Learn more about the MIA Volunteer Ambassador Program, where about 80 volunteers help to welcome visitors to the Greater Miami area. For more animal-loving No Joe Schmos, check out the pet detective and the pooper scooper. This entry was posted in Cool jobs, Volunteer opportunities and tagged animal volunteer, dogs, miami international airport, working with animals by Megan Hess. Bookmark the permalink.